On the wrong side of 60 you’d be forgiven for thinking that it was time for Liam Neeson to hang up his gun and move away from the cold, steely world of action films, into the fuzzy and sentimental territory of a rom-com. 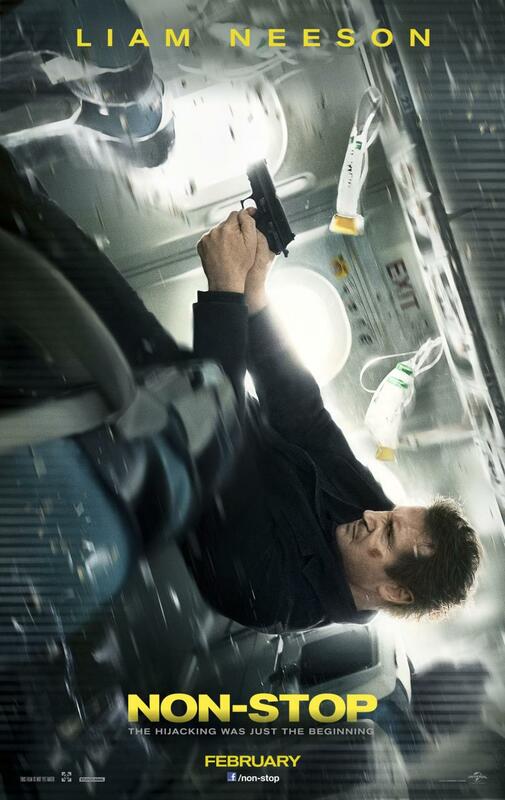 Thankfully he and director Jaume Collet-Serra, who Neeson previously worked with on the disappointing thriller Unknown, have decided to continue with the action thriller theme in Taken on a Plane, sorry… Non-Stop. Neeson plays troubled US air marshal Bill Marks as he begins a non-stop flight from New York to London, though from the outset it is obvious this will be no ordinary journey. Marks is a man with a chequered past. From suffering with depression after the breakdown of his marriage to his subsequent alcoholism, everything seems to be utterly gloomy. Soon after take off, Neeson’s character is sent numerous anonymous texts stating that a person on board will be killed every 20 minutes unless $150 million is transferred into a bank account. Cue Neeson’s trademark gruff tone as he shouts about the cabin trying to discover just who is behind the messages. It’s fair to say things aren’t as simple as that and Collet-Serra’s spirited direction keeps things moving with more twists than a curly-wurly. Julianne Moore stars as Marks’s ‘seat neighbour’ and is as usual excellent but unusually bland, portraying a character that numerous other actresses could’ve fitted into quite easily – it’s a strange departure from Moore’s more deep characterisations, but she does it well despite the lack of material she’s given to work with. The plot is well driven by the excellent cinematography, using the confined spaces of an aircraft to great effect with sweeping shots of the cabin over the heads of passengers and the use of aeroplane windows to move in and out of the fuselage. Technology plays a huge part in Non-Stop, the constant stream of text messages that Neeson receives could have made the film fall flat, but thankfully each one is put up on the screen allowing the audience to read them in real time, rather than stopping the story dead and allowing boredom to set in. Whilst the story and plot are first-rate, the special effects unfortunately are not such a blast. Whilst the majority of them are passable given the film’s relatively small budget of $50 million, the shots of the aircraft towards the finale are underwhelming and look like they belong in a video game, not a Hollywood blockbuster. It’s an unfortunate lapse in an otherwise very competent film. Thankfully Neeson’s now applauded acting technique distracts from these moments enough to steer Non-Stop to a pulse-racing and very satisfying conclusion. Overall, Non-Stop is good fun from start to finish and barely slows within its succinct running time. However, it all feels very familiar and this is a problem for its main star too. For all of Neeson’s fans this is another good notch on their bedposts – but I doubt it will bring any newcomers to his admittedly large following, meaning he runs of the risk of being typecast. Nevertheless, apart from a few lapses in special effects and a rather bland Julianne Moore, Non-Stop is definitely worth a watch – even if there may be a sense of deja vu. Overall: Great fun for fans of Neeson, but not much for newcomers. Just a more wordy version of my predicted review then? ie. It’s enjoyable, but it’s just Taken again. Not that that is a bad thing. It seems you were right Matt. 😉 Thanks for your comments.